Well, it must be Fall, because I talked about sage on Friday and today I've got brussels sprouts for you! The rest of the world may be trying to OD on pumpkin spice, but I've always been more about the green joys of this time of year, the earthy sage, dark-skinned squashes, and my favorite, the brussels sprout. But today, I'm not going to tell you about a fun way to roast them or give you another reason to pair them with bacon (though that is never not a good idea). 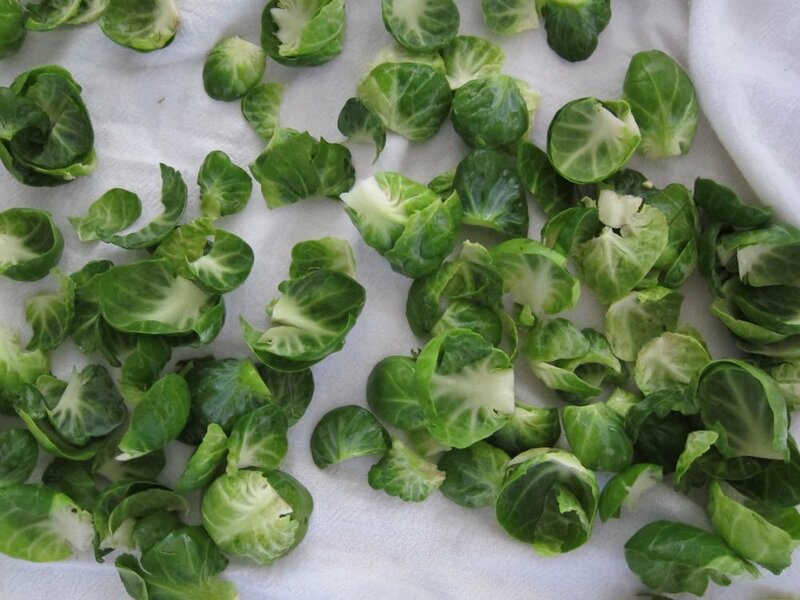 Instead, I've got another way to use up any of the leaves that you may accumulate when cleaning and prepping your brussels sprouts. I find that when I'm trimming my sprouts and cutting them in half, leaves always fall away. I usually don't add these wayward leaves to whatever dish I'm making, but they are perfectly ok to eat after a good cleaning, so don't throw them out! You could certainly fry them or roast them into chips, but did you know that you can also turn them into pesto? I know. My mind was blown too. I've made pesto out of just about every herb you can grow, but it never occurred to me to make it out of vegetables. 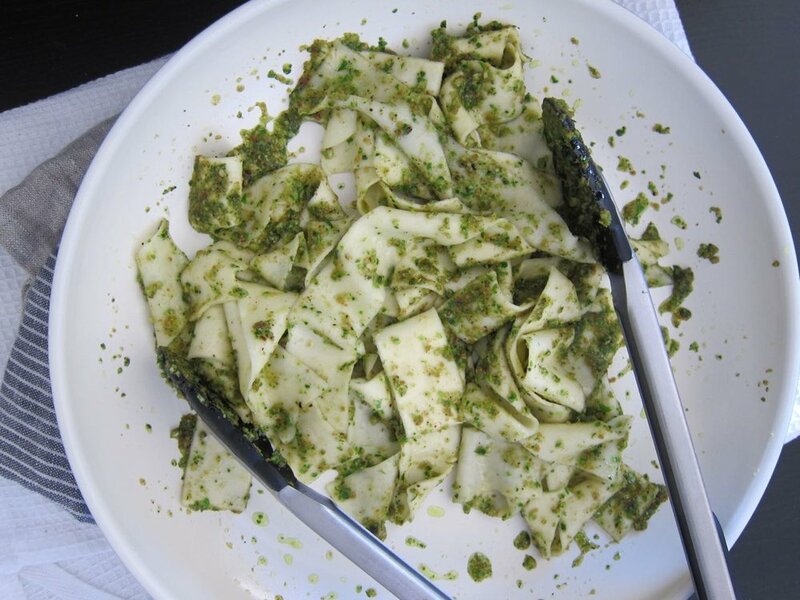 As it turns out though, brussels sprout leaves lend themselves well to pesto, pureeing into a vibrant, green sauce that acts as a perfect way to deliver veggies with your pasta (or chicken or fish or wherever else pesto brings you joy). And here, paired with flavorful hazelnuts, they combine into a pesto that to me, is pure Fall on a plate. Heat oven to 350 degrees. Toast hazelnuts for 10-15 minutes, let cool a bit and then rub off skins. Add toasted nuts to the bowl of a food processor and pulse until finely ground. Add brussels sprout leaves, parmesan, garlic and vinegar and pulse until finely ground. With processor running, add enough oil until a smooth sauce forms (about a little less than 1/2 cup). Transfer to a small bowl and add salt and pepper to taste. To serve, cook pasta to al dente. 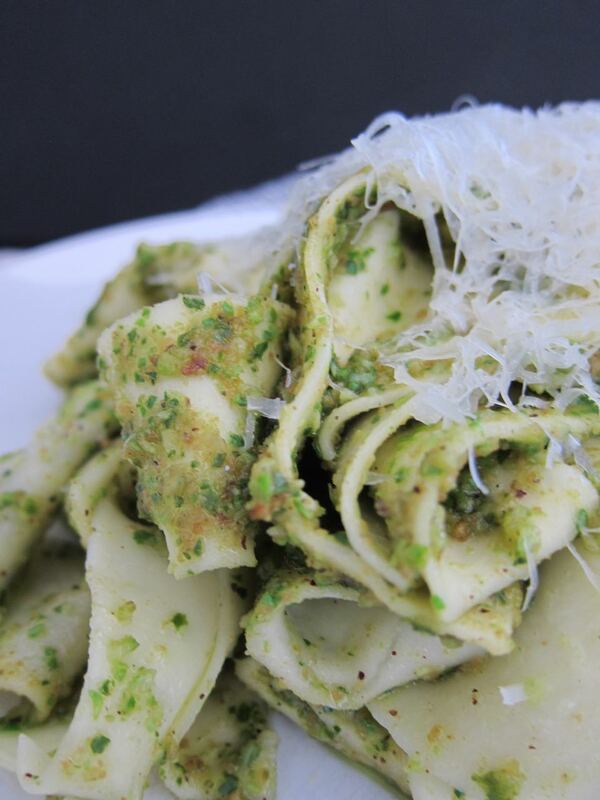 Heat pesto over medium heat in a skillet, add drained pasta and toss to coat. Transfer to a serving dish and garnish with grated parmesan, if desired.